Mazu goes by many names: Goddess of the Sea, Goddess of Mercy, and Heavenly Queen. Her literal name in Chinese is “Mother” (Ma) and “Ancestor” (zu). According to legend, she lived in Fujian, as Lin Moniang, during the Song Dynasty. The year of her birth is usually given as 960. While still quite young, perhaps only sixteen years of age, she died of exhaustion after swimming far out to sea to save her drowning father and brother. Her courage inspired fishermen in Fujian to honor and pray to her in times of need and distress. Mazu is believed by many to be a manifestation of Guanyin, the Bodhisattva of Compassion. Today Mazu is worshiped through coastal China and in many regions of Southeast Asia. She is perhaps the most venerated deity in Taiwan. 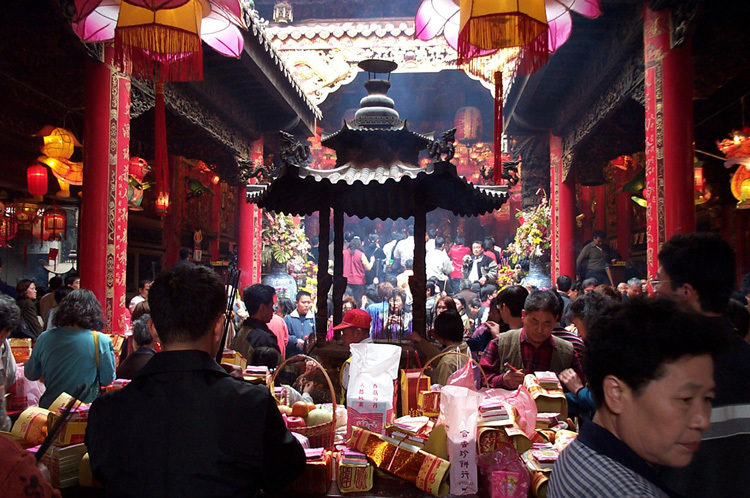 This photograph was taken on the first day of the Lunar New Year, 2002, at the Tachia Temple dedicated to Mazu in central Taiwan.